These past few months have been filled with some personal challenges. My heart arrhythmias had progressed to the point that something had to be done. So almost three weeks ago I underwent a cardiac procedure whose intent was to alleviate these irregular heartbeats and break the cycle of rushing to the ER at inopportune times and essentially disrupting the quality of my life. The recovery has not been easy, but I am progressing, and hoping that a new lease on life is right around the corner. So! 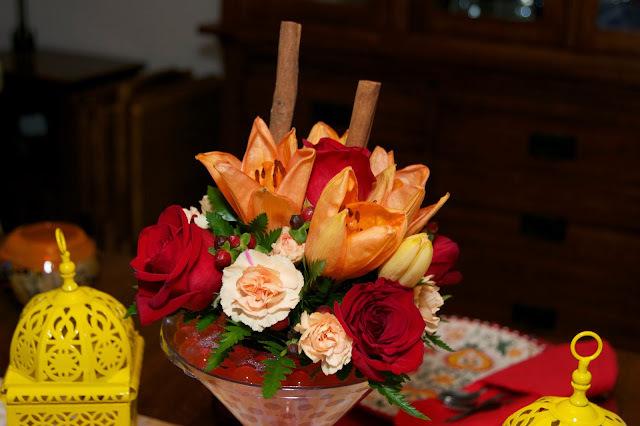 A special niece and nephew of mine sent a "Get Well" arrangement that signaled "Cheers for a New Beginning!" As soon as it arrived, I knew a tablescape was about to be born. I redirected my energy from keeping track of medications, controlled activity and diet and lost myself in the creativity and fun of creating a tablescape of celebration. It's fairly simple (can't exert myself too much), but I love the colors and the whimsical nature of the floral arrangement and wanted to share it with you. I started with these placements that I found at HomeGoods. I love the three-dimensional beads on them that reflect a fun occasion. 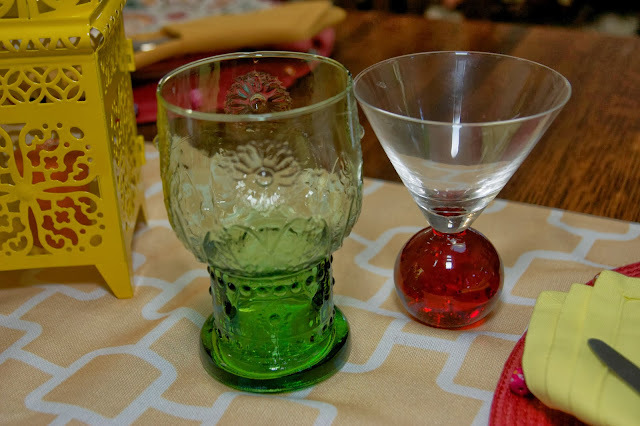 I originally got them, thinking they'd be a part of a summer table, but they seem appropriate now. 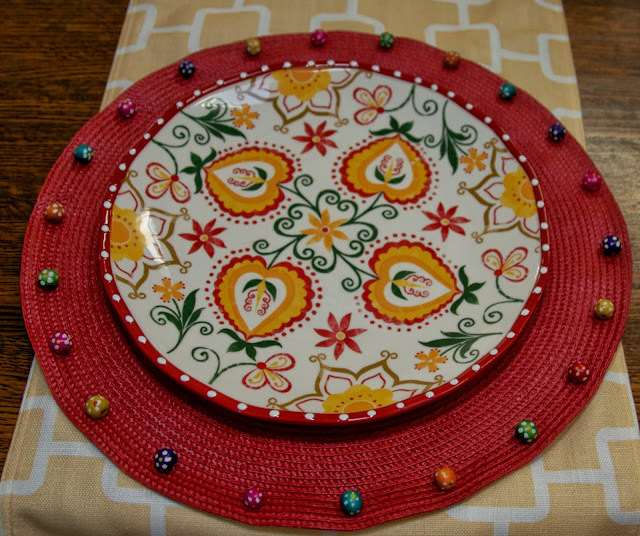 I added plates that were on sale at Target this past summer. I was thrilled to see that the colors in them matched the flowers so well. 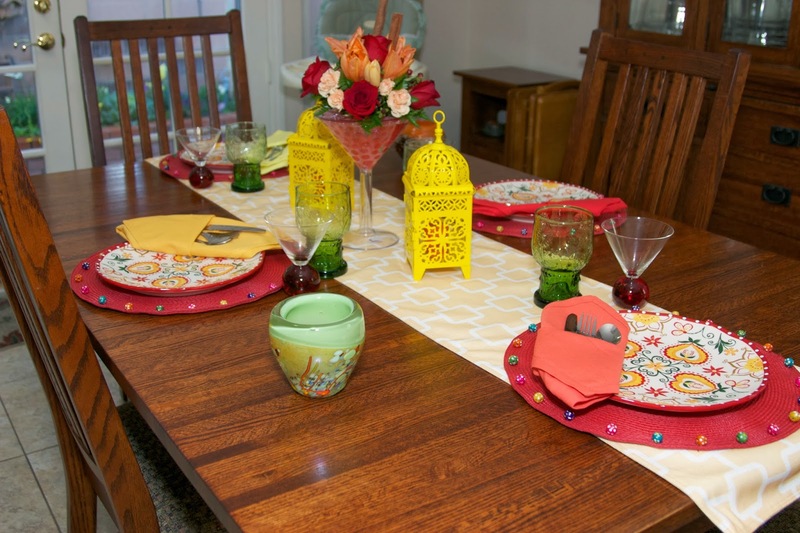 Note the peach, yellow, red and green pattern on the dishes and the floral arrangement! It was meant to be! The napkins and flatware were bought on the same day and were designed to coordinate with the plates. I think the happy colors are important to reflect the theme of the table. I added green goblets from Pier One and martini glasses that were gifted many years ago, and reflect the centerpiece! A newly purchased table runner from HomeGoods (again, it was on sale, and I was saving it for spring/summer) was the starting point for the centerpiece. 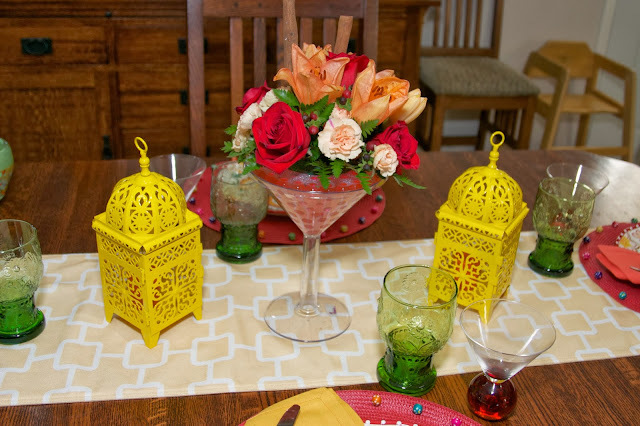 The floral arrangement was the main event, but I also added my yellow lanterns with orange candles to coordinate with the bright colors. How fun is that giant martini glass?! I added some additional candle holders for color and light. These holders were found on an anniversary trip to Ventura, CA and were at a craft fair. 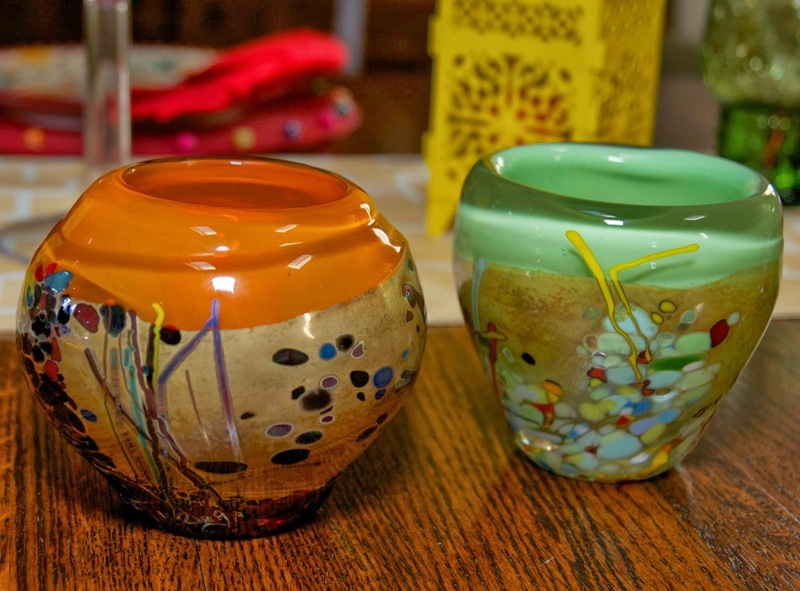 They are hand blown glass and their lovely patterns reflect candlelight beautifully. I know this tablescape is different from those we tablescapers are creating for the holidays, but I wanted to take advantage of this thoughtful gift of good wishes. Enjoy!! Your table is a true celebration! I hope the heart procedure is a success and you are well recovered in time for Christmas!! 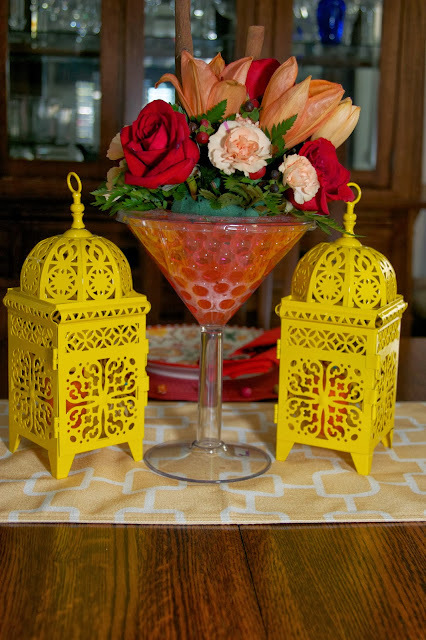 I can't believe you have the perfect dishes for the flowers! Take good care and enjoy the season. Festive is gorgeous. Love the color combo. Wow, what a gorgeous table, Rosie. It is nice the flowers matched your Mediterranean style dishes. 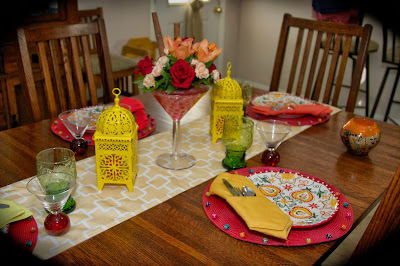 Your table is beautiful and I think it was such a good idea to do it around those pretty flowers...it is a happy table...I am glad you are progressing after your procedure..and hope you continue to quickly get better..
Cheery, bright, and colorful...love it. Very lovely table. Hoping you are on the recovery! A very Merry tablescape indeed Rosie! 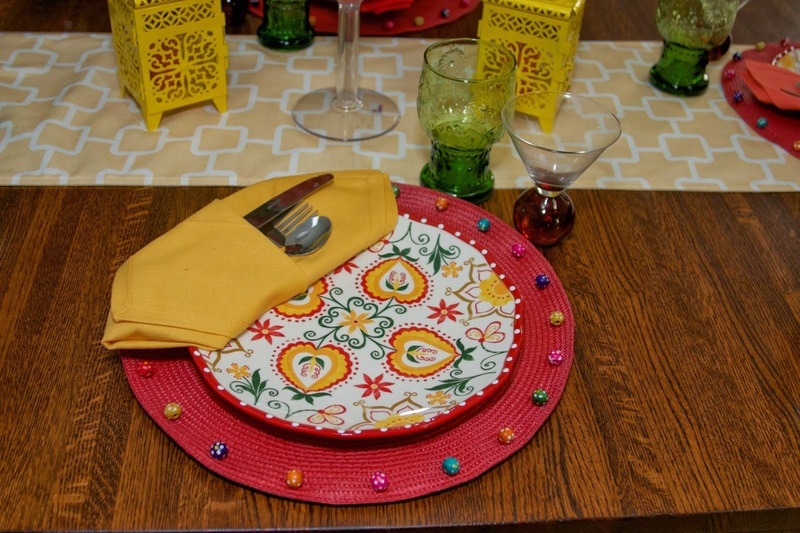 Love all the bright colors, and the placemats are so cute! 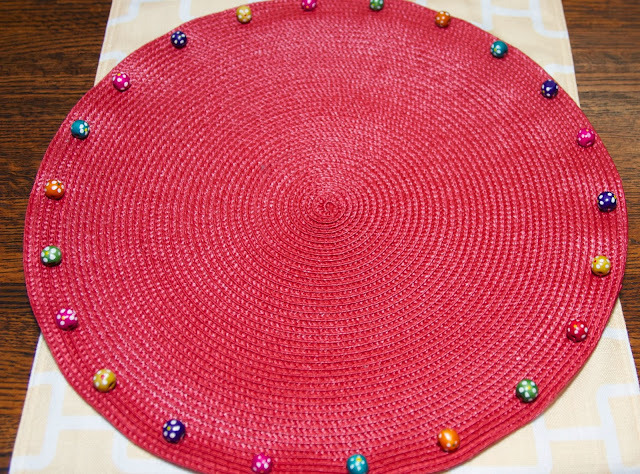 The table is a reflection of your very positive and cheerful attitude about your recent health challenges and recovery. I hope you are continuing to bounce back! Happy holidays! Hope you are on the road to recovery and better health.